My favorite scene in the Disney classic Fantasia is the one in which the Earth evolves at warp speed, from a dark mass to a frenzy of erupting volcanoes and thundering dinosaurs. Normally, wine tasting does not make me think of this movie. But in the Okanagan, it does. The wine scene in this achingly gorgeous British Columbia valley, with its long chain of lakes gleaming down the center, started heating up only about 20 years ago. That’s when Okanagan winemakers, facing a new free-trade agreement with the United States, started ripping out the musky hybrid grapes they’d been using (mainly for jug wine) and furiously planting high-quality European varietals so that they could compete with American imports. They tried everything and anything, because the valley’s unique geography ― cooler in the north and hot in the south, with 100 miles of microclimates in between ― makes it possible to grow an incredible range of cold- and hot-weather grapes. That’s why wine tasting in the Okanagan today is so much fun: The valley is still in full-throttle discovery mode, with a 19 percent increase in the number of wineries in the past two years and different kinds of grapes going in all the time ― nearly 60 varietals, planted all over the benchlands, hillsides, and valley floor. Where else are you going to find South African Pinotage, German Riesling, Swiss Chasselas, Italian Sangiovese, and French Mourvèdre growing in such close proximity ― and for the most part done well? Add to this the Okanagan’s natural beauty (it’s a hallowed summer-vacation spot for Canadians), its wide range of non-wine-related things for the whole family to do (from riding the century-old Kettle Valley steam train and swimming in those pristine lakes to biking and hiking), and its lush orchards selling juicy peaches and cherries on the roadside, and you’ve got a wine-country experience like no other. This is by no means a complete list of wineries in the Okanagan Valley. (In June 2009, when I wrote this list, there were nearly 100 in business, with many more permits pending.) However, if you hit several of the wineries below, you’ll get a good sense of the Okanagan’s incredible winemaking diversity and energy. Resembling a cross between a castle and a pueblo, Burrowing Owl winery rises from the sandy southern end of the Okanagan on some of the most coveted grape-growing land in the valley. The winery’s Sonora Room restaurant pairs Rob Cordonier’s excellent B.C.-focused cooking with Burrowing Owl’s wines. Not to be missed: the eye-opening Cab Franc ― with its lush, ripe, blackberry fruit and no trace of this grape’s typical thin green character ― or the lovely, steely Merlot. Also nice: Burrowing Owl also has a 10-room inn; breakfast is included (from $151.12 U.S.). All revenue from wine tastings goes to help protect the winery’s namesake, which is native to the area. Hours: Tasting room open daily May-Sep, by appointment during off season; in Oliver; 877/498-0620. Established in 1932, Calona is the valley’s oldest continuously operated winery, and downtown Kelowna has grown right up around it. (No vineyards here; the grapes are trucked in from elsewhere in the valley). Calona is known particularly for its Ehrenfelser ice wine, its Pinot Blanc, and its Pinot Gris ― and for Sovereign Opal, an aromatic white wine made from a grape of the same name, created at a nearby research station and exclusive to Calona. Tasting room (shared with sister winery Sandhill) open daily; in Kelowna; 250/762-3332. Designed to look like a white Mediterranean villa, CedarCreek has twice been named Winery of the Year at the annual Canadian Wine Awards. Senator Ross Fitzpatrick, who grew up in an Okanagan farming family, founded this winery in 1986 on choice land converted from orchards. Winemaker Tom DiBello, a University of California, Davis, grad who’s worked at Stag’s Leap Wine Cellars in Napa and Cape Mentelle in Australia, makes a bright, vibrant Platinum Merlot full of plums and cherries, with the rich smoothness of melted milk chocolate. It ranks at the top of Okanagan Merlots. “You can get fruit to physical maturity in the Okanagan, but with good acidity,” he says of the conditions here: a short growing season, but with long northern days of hot sunlight followed by cool nights. “The fruit can hang on the vine longer and develop identity. B.C. is a beautiful place to make wine.” His Ehrenfelser, with its gorgeous bouquet of sweet apricots and honey, and dried apricots on the palate, is a steal: about $15 U.S. Tasting room open daily, tours daily May-Oct or by appointment Nov-Apr; in Kelowna; 250/764 8866. Using Old World recipes from her Polish grandfather, Miranda Halladay ― along with husband Del and Bordeaux-trained winemaker Christine Leroux ― makes beautiful fruit wines using fine-wine techniques and, for the most part, locally grown fruit. Their “dinner wines” ― apple, cherry, black currant, pear ― are complex and well suited to savory food. The sweet wines (apricot, cassis, crabapple, even a cherry port cask-aged by the solera method) are packed with nuanced flavors. And then there are two beautiful sparkling wines: “Pink Elephant” (Granny Smith apple wine with cassis dosage) and “The Little King” (Granny Smith with raspberry dosage). Sit on Elephant Island’s lovely, shaded patio and sip away ― for no charge; Miranda and Del want to visitors to taste as much as possible so that they erase any former (likely bad) impressions of fruit wine. There’s even a kids’ area equipped with toy planes, stuffed animals, and tea sets. Tasting room open daily Apr-Oct, by appointment Nov-Mar; in Naramata; 250/496-5522. Organic tree fruit grown in the Similkameen, a small valley adjoining the Okanagan, is the focus of the winemaking here. The warm and friendly owners, Kim Brind’Amour and Steve Venables, grow more than 60 varieties of cherries, peaches, plums, apricots, apples, and European and Asian pears, and their wines consistently win national and regional awards. The place itself does evoke Eden, what with its super-lush and tempting orchards and its frisky bottlings. A few examples: “Plumiscious Plum Mistelle” (fortified plum wine), “Pearsuasion” (dry table wine), and “Crushed Innocence” (white peach wine). It’s heaven to taste one or more of them while picnicking in the winery’s gardens by the silvery Similkameen River. Tasting room open daily Apr-Oct, by appointment Nov-Mar; in Cawston; 250/499-2649. When Trudy and George Heiss started this winery in 1972, one of the first varieties they planted was Pinot Gris ― sometimes called grauar mönch, or gray monk, in Austria. At the time, fewer than 10 wineries existed in the Okanagan back then; now there are close to 100. Still, Gray Monk is one of the only wineries here to produce wine from the German grape Siegerrebe, a cross between Gewürtztraminer and the beautifully named grape Madeleine Angevine. It’s an extremely aromatic white wine that, in the words of the B.C. Wine Institute’s Jay Drysdale, “stands up to a flurry of flavors” (and it’s less than $15 U.S.). Gray Monk makes 20 other wines, including that seminal Pinot Gris. Call for hours; in Kelowna; 250/766-3168. Named Canada’s Winery of the Year for the fourth time by Wine Access Canadian Wine Awards, Jackson-Triggs is led by two young winemakers: Brooke Blair, a young Australian in charge of reds, who makes a luscious, tooth-purpling Shiraz that smells of black pepper and mint, and tastes of plums and blueberries; and Derek Kontkanen, who’s in charge of whites and ice wines. Although the whole Jackson-Triggs operation is owned by the giant wine producer Vincor, the lovely vineyards ― 410 acres leased from the Osoyoos tribe ― Jackson-Triggs also has a branch in Ontario, and between them the two corporate siblings have won 19 International Wine and Spirit Competition awards. Tasting room open daily; in Oliver; 250/498-4500. One of newest wineries in the Okanagan (opened in 2008), Kalala belongs to Karnail Singh Sidhu, an engineer from the Punjab region of India who emigrated here and became an organic fruit farmer. Sidhu named his winery after the village where he was born, a place where (as legend has it) a wolf and a sheep were found sitting together peacefully. His wines, made from organic grapes, attempt to embody a similar kind of harmony, and each bottle bears the image of a wolf cuddling up to a lamb. Kalala makes five whites; four reds, including an interesting pale-red Zweigelt (the main Austrian varietal), tasting of ripe red raspberries and a hint of leather; and one rosé, a late harvest Pinot Blanc, and an ice wine. Tasting room open daily; in Kelowna; 250/768-9700. Australians Niva and Jeff Martin are both from winemaking families Down Under, and grew up in the industry. Their trim, light-filled little tasting room, surrounded by grapevines, offers a Semillon tasting powerfully of grapefruit and gooseberry, and a Muscat of Alexandria that evokes pineapple and lichi (“Hawaii in a bottle!” crowed one visitor.) Their Chardonnay has 50 percent of the final blend aged in oak, but is not overpowered by wood; instead, the nose carries a delectable fragrance of nectarine. As Jeff puts it, “You should taste the vineyard, not the lumberyard.” The wines are extremely reasonably priced, with most whites at around or under $18 U.S. Tasting room open daily May-Oct, by appointment in the off-season; in Penticton; 250/492-6690. Often called “the Mondavi of the Okanagan,” Mission Hill’s grandeur sets it apart from all other wineries in the valley. The place itself, a Tuscan villa reimagined as a series of clean-lined blocks and towers, does take the breath away, as does its view of Okanagan Lake. Come to admire the Chagall tapestry, the fabulous kitchens, the grass-covered sunken amphitheater, the very good Terrace restaurant with its strong emphasis on local artisanal ingredients, and the excellent wines, among the few from the Okanagan that are available in the United States. For a good introduction to Okanagan wine, take one of Mission Hill’s three tours, each of which includes a tasting (1 to 1 ½ hours; tastings from $6.07 U.S.). Call for hours; in West Kelowna; 250/768-6498. The Osoyoos, one of seven Okanagan tribes (called “bands” in Canada), have lived in the southern part of the valley for centuries. They own 24 percent of the grape-growing land in the valley and established their own vineyards in 1968. Nk’Mip (IN-ka-meep) Cellars is the only native-owned winery in North America, and as of 2008 had won close to 200 awards, including several international ones (the meritage and ice wine are particularly delicious). It’s part of a whole constellation of buildings make up the tribe’s new resort, including a luxury hotel in glowing ochre and cinnamon, with a spa featuring indigenous and desert-based treatments, and the Nk’Mip Desert Cultural Centre, a beautiful building made of rammed earth, with a roof planted with local vegetation. Tasting room open May-Oct, tours at 11, 1, and 3; in Osoyoos; 250/495-2985. Paul Gardner, a former marine engineer obsessed with wine (he began tinkering with it in his parents’ garage), and wife Julie Rennie planted their first vineyard in 1997. From the winery, set right into the granite cliffs overlooking Skaha Lake, Gardner and winemaker Adam Pearce make a silky, terrific blend of Merlot, Syrah, Cabernet Franc, Cabernet Sauvignon, and Gamay grapes called Pentage, after the Greek word penta, or five―and tasting of chocolate, cherries, and anise. They set the bar high for themselves; says Paul, “People like to compare this place to other, more famous places. But we like to think that someday people will say that a certain spot reminds them of Pentâge Winery, in the Okanagan.” No tastings; purchase by appointment only; in Penticton; 250/493-4018. Grant Stanley, the dashing winemaker, has made Pinot Noir his main passion, but he doesn’t neglect his large portfolio of other varietals. Quails’ Gate is one of the older wineries in the valley, with plantings of 30- and 40-year-old Maréchal Foch vines. The Okanagan once had a lot of Maréchal Foch, a high-yield hybrid that, when treated well, makes good wine. 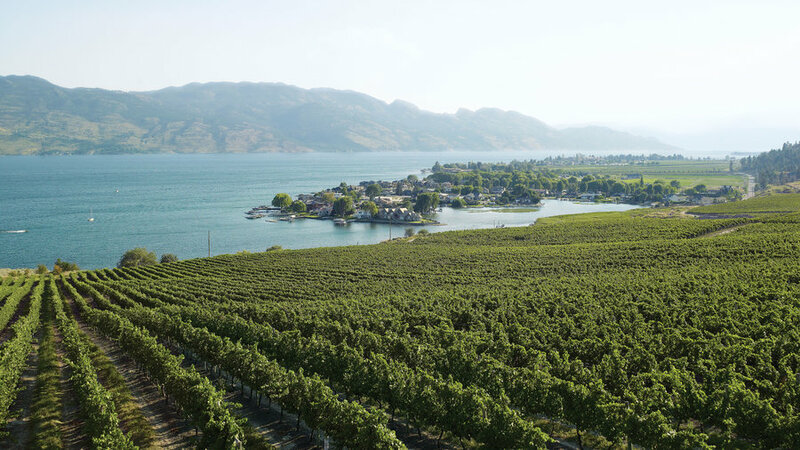 At Quails’ Gate, it’s the valley’s best ― dark as midnight and ranging in flavor from chocolaty (Old Vines Foch) to spicy, smoky, and gamey (Old Vines Foch Reserve). Quails’ Gate was once a pioneer homestead (the original 1870s cottage remains), and is the valley’s prettiest winery, with drop-dead gorgeous views of the lake, mountains, and vines from enormous windows in the tasting room, which is stocked not only with the wines but also edible delicacies from the valley. The Old Vines restaurant is top notch. Open daily; in Kelowna; 800/420-4008. Apple ciders are the specialty at this 105-year-old orchard. Try one of five award-winning iced ciders, pressed from apples that have frozen on the trees; Granny Smith is the most tart, and the Ambrosia ― from a lovely old apple variety developed in the Okanagan ― the most unusual, with a smoky, cinnamony, caramel flavor. Then clamber onto the tractor-pulled wagon, with kids if you have them, for a tour of the orchard in a tractor (with a stop to pet the farm animals). Don’t miss the fabulous rose gardens either. Tasting room and store open May–Oct; call for tour price; at Kelowna Land & Orchard, Kelowna; 250/763-1091; . Howard Soon, Sandhill’s master winemaker, is a legend in the Okanagan and has probably been making wine longer than anyone else in the valley. He’s known for working in partnership with the winery’s four grape growers (each of whom oversee a separate vineyard), taking the best of what they give him and coa it gently into wine. All of his bottlings are single vineyard and are very reasonably priced; especially worth seeking out are the Pinot Blanc (which uses oak, says winemaker Soon, “for good and not for evil”); and the lean, crisp, gold-green Pinot Gris (great with seafood). Tasting room (shared with sister winery Calona) open daily; in Kelowna; 250/762-9144. Cheerful Andy Gebert, a native of Switzerland, runs the winery with brother Leo; they live right next door to one another and are married to a pair of sisters. Andy loves oak and Leo doesn’t, so, being problem solvers and good brothers, they each created their own label: Oak Bay, for wines aged in French and American barrels; and St. Hubertus, for bottlings without a trace of oak. The Geberts began as grape growers, and they still get an enormous amount of pleasure seeing which varietals (they grow 14) will thrive in their vineyards. Here you can taste everything from Chasselas, a minerally, citrusy Swiss varietal, to tinkerings like Frizzante Rose, a fresh, fun sparkling Gamay. “That’s what’s nice about the New World,” says Andy. “You can try new things and not get beaten up behind the Dumpster.” Tasting room open daily May-Oct, closed Sun Nov-Apr; 250/764-7888. A handsome, sunny little winery on the eastern slopes overlooking of Okanagan Lake. Tantalus is one of the few highly focused wineries in this area, pouring its energies into just two estate-grown wines, all organic: Riesling and Pinot Noir. Many of its vines were planted in the late ‘70s and early ‘80s, which lends its wines their depth of character; make sure you try the “Old Vines Riesling,” which is mouthwatering ― deliciously minerally yet toasty, with a long, long finish. It’s a fine example of what Okanagan whites can be: lower in alcohol, crisp, well balanced, and perfect with food. Bonus: The bottles are gorgeous, with labels depicting carved Tlingit masks from the B.C. coast. Call for hours; in Kelowna; 250/764-0778. Set right on the curving road at the beginning of the Naramata Bench, Township 7 ― which also has a winery and vineyards in Langley, near Vancouver ― produces lean, acidic, palate-tingling wines from Okanagan fruit. Its unoaked Chardonnay has wonderfully intense fruit thanks to the ripening opportunities that the valley’s long summer days provide. Also good: its rosé, filled with rhubarb and raspberry. Tasting room open daily May-Oct; in Naramata; 250/770-1743. In this part of the world, Merlot is not the flabby beverage you may often have spurned. The cooler growing conditions brighten it and give it spine and structure and panache. Many Okanagan winemakers think of it as their “muscle wine” ― and curiously, it’s Cabernet Sauvignon that tends to be the juicy, softer partner in Merlot–Cab Sauv blends. 2. Is that a saguaro? No, but if you’re in the southern end of the Okanagan, you are in fact in a desert. Grapes that do well in blazing weather ― like Zinfandel and Syrah (known here by its Australian name, Shiraz) ― thrive in this part of the valley, where temperatures can reach 105° in summer. Incredibly, the same patch of land can do ice as well as fire. In late November, frost settles over the vines, freezing any fruit left there. Pressed quickly, the grapes (usually Riesling, but sometimes Vidal or other varietals) yield ice wine, the intense, sweet golden wine for which Canada is famous. Because it’s so labor intensive to produce and yields are so low, it’s the most expensive wine you’ll buy in the Okanagan, upward of $26 U.S. for a slender 150-ml. bottle. A nifty cocktail you’ll see in the valley: ice wine topped with sparkling wine. Not all those funky old hybrid vines were pulled out, and some of their grapes can produce good stuff. Keep your eyes open for loamy, dark red Maréchal Foch, Baco Noir, and Vidal. Besides Baco Noir, the Okanagan is a living treasury of little-known grapes from far-flung corners. How about Michurinetz from Russia? The light and delicate white Ehrenfelser? Take a sip of Austrian Zweigelt or Blau-fränkisch, and how about Sieger-rebe ― a super-aromatic German creation? Here’s one that exists only in the Okanagan: Sovereign Opal, a white grape created at a local research institute. Calona Vineyards makes a deliciously floral wine from it for about $12 U.S. a bottle. In the past five years or so, price tags of up to $60 U.S. have started appearing for reserve wines or skillful Bordeaux-style blends. But in general, Okanagan wines are a great value, with most bottles less than $20 U.S. The Germans who immigrated here in the late 1800s grew such good fruit that the valley became renowned for it. Right away, enterprising winemakers began bottling this fruit, and what you’ll find now is often elegant, subtle, and delicious. Top producers include Forbidden Fruit Winery, which grows eight kinds of peaches (some of them heirlooms) for its peach wines, and Elephant Island Orchard Wines, which makes a knockout cherry wine. The all-organic Kalala vineyards, one of the Okanagan’s newest wineries, is owned by an engineer from the Punjab region of India and is named after a village there. 9. Biggest vineyard owner in the valley? No, not Vincor, the giant Canadian company that is the fourth-largest wine producer in North America. Instead, it’s Vincor’s partner: the indigenous Osoyoos Indian Band, which has lived here for centuries. They own 25 percent of the total vineyard acreage in the valley, leasing most of it to Vincor and other producers, and have their own winery, Nk’Mip, next to their stunning desert museum built of rammed earth. Although you can take a few cases of wine home to the States as checked luggage (or drive it across the border for a fee of a few cents per bottle), thanks to a thicket of U.S. Customs regulations it’s nearly impossible for wineries to ship their wines to you ― and the laws say you can’t ship to yourself, either. All the more reason, then, to visit this lovely valley and taste the wine in its natural setting. В интеренете нашел нужный портал со статьями про купити лінзи. Наша организация предлагает купить коттедж в лесниках у нашего менеджера.